To make the brine, place the bay leaves, peppercorns, salt, sugar, vinegar and water in a large saucepan over high heat. Bring to the boil and cook, stirring, for 4 minutes or until the salt and sugar have dissolved. Remove from the heat and set aside to cool completely. Tie the legs of the chicken with kitchen string and place, breast-side down, in the brine. Cover and refrigerate for 4–8 hours. Preheat oven to 200°C. Place the lemon slices onto a large oven dish lined with non-stick baking paper. Remove the chicken and bay leaves from the brine, discarding the brine liquid. 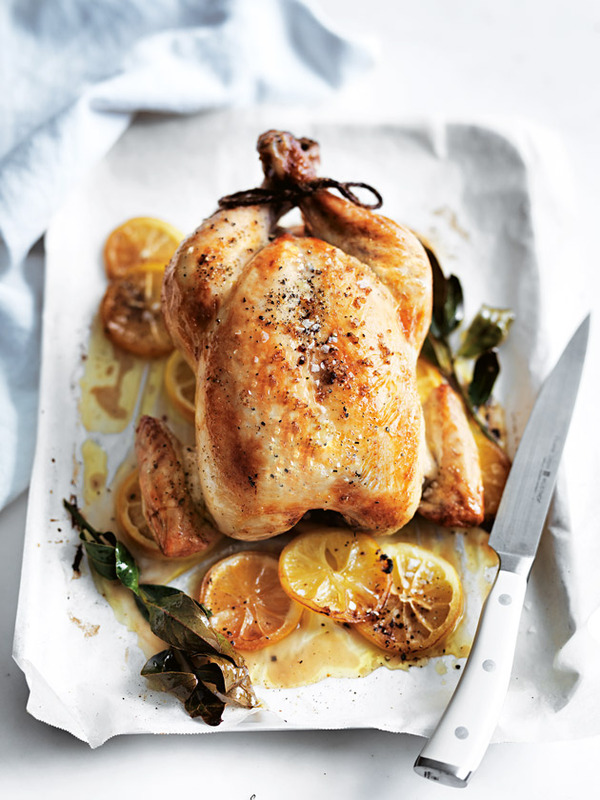 Place the chicken, breast-side up, on top of the lemon with the bay leaves. Drizzle with the oil and sprinkle with salt and pepper. Cook for 45–50 minutes or until the chicken is golden brown and cooked through. Serves 4. + Make sure not to brine the chicken for longer than 12 hours or it may be too salty. + You can prepare the brine ahead of time. It can be stored in an airtight container in the fridge for up to two days. + You can use this same brining solution when cooking pork chops or chicken breasts. Hi Tamara, just pat the chicken dry. We don’t recommend rinsing poultry. Many thanks, the DH team. Does the chicken need to be rinsed after the brine (before baking)?